There are no words to describe the loss. From Slam Sports, "Former Toronto Maple Leafs tough guy Wade Belak was found dead in a Toronto hotel Wednesday. The 35-year-old from Saskatoon was found in the tony 1 King West hotel and condo residence." Belak was scheduled to be one of the participants in this season's "Battle of the Blades" and was starting a new radio show in Nashville on 102.5 The Game. Here is Belak's official biography. He leaves behind his wife of nine years, Jennifer Jordan Russell, and two daughters, Andie Marie (7) and Alex Grace (5). Our prayers go out to his family, friends, and fans. Update... Here are more details from Sean Fitz-Gerald at the National Post. The Nashville Predators announced an opportunity for folks to win free season tickets at the "First Ever Smashville Text Scavenger Hunt" that will be held on Saturday, September 10 at the 2011-12 single game ticket sale. We have made it to mid week in what has to be the slowest week for hockey news of the summer. Yesterday, on RLD Hockey Talk, NHL Home Ice's Mick Kern discussed the dearth of real news and how he has to search for material for the "Around the Rinks in 90 Seconds" segments at this time of year. As always, we look far and wide to try to give you hockey news every day to help you through the dog days of the hockey summer. Make the jump for today's news and links. Brent Peterson's fundraiser for the Predators' Foundation and Parkinson's research is approaching another sellout. Less than 100 tickets remain for next week's "Petey's Preds Party" and the golf tournament held the next day is already a hard sellout with 60 teams participating. As hurricane Irene left millions without power some were hit much harder. A fellow blogger and Tweeter than many of you know lost everything as water swept away her house and belongings and has been left living in her vehicle. She needs help in her recovery efforts. Some of the best folks that I've ever met have stepped up to organize aid efforts and includes Carlos Figueiredo, Dani Muccio, Matt Reitz, Mark Willoughby, and many others. At all of these sites there is a PayPal widget where you can contribute any amount of aid that you wish. An anonymous donor has agreed to match the first $1000 to help her get on her feet again. We would have the widget up but there is some type of issue with the code ad the Blogger format. We will keep trying. The doggiest of the dog days of summer are upon hockey fans as we are less than two weeks before the opening of rookie camps around the league. Veteran players will start filtering into town this week with the pace picking up after Labor day. Informal skates will move from Canada to the local practice rinks as the weeks progress. There is still a sizable group of free agents on the market that have yet to sign so expect to see a few announcements in the coming days of players with NHL experience getting invited to various camps on a tryout basis. Locally, there is excitement in the air with the birth of a new sports voice in Nashville that will have more Predator talk than Music City has ever experienced. 102.5 The Game launched at 6 a.m. today. My personal disdain for local terrestrial radio may be tempered with the line-up they have planned. With The Game promising more Pred-centric programming I may be lured away from NHL Home Ice on XM to hear more hockey on the local airwaves. As I finish the weekend roundup, the US East coast is getting pounded with wind and rain from Hurricane Irene and it looks like it will be tracking the coast line all the way to New York City and Long Island. We send prayers to all our friends in the East and urge everyone to hang close with friends and family and stay safe. Back in Nashville, if you are looking for stuff to do this weekend, the Predators are involved in five big events including a race, an open house, sled hockey, baseball, and wild animals. If you are at the Bridgestone, you can see the new dasher boards. The last fateful game in the Preds-Canucks series replays tonight at 5:00 and 9:00 p.m. on NHL Network. Jeremy Gover is the latest member of Bloggers Row to have a guest post at Predators.com where he discusses what makes the game experience in Smashville so special. Jeremy also has the latest episode of the 303:30 with Pete Weber and 102.5's Darren McFarland. Ryan Suter is the highlighted player at 24/7 today in their series of player previews. The number one moment in Dirk Hoag's postseason countdown was... David Legwand's empty netter. Go to OTF to relive the moment. Dirk also does some serious number crunching in a feature on how the Preds will replace the offense from the departed players. Kris Martel wonders what the Predators will get out of Colin Wilson this season. It was revealed via Twitter that Joe Dubin, from Channel 2 Sports will host an hour long sports show from 2-3 p.m. on 102.5 The Game beginning on Monday. The current format at 102.5 is doing some odd things in preparation for Monday's 6 a.m. kickoff of the new format. Also on The Game from @BelakWade: Nashvillians tune into the " WadeBelak Show "Airing this Monday night 9-10pm on 102.5 The Game. RLD Hockey's Fantasy Week moves on to the goaltender preview and the top five Fantasy Comeback players. The last post may be the most important, with players to avoid. If you want a keen series on fantasy hockey, you should go back through the entire series. Ryan Porth and Jeff Angus did a great job. RLD's Saturday face-off has a three way argument about which team improved the most. Matt Reitz has his weekly hockey guy in California round-up. Mike Modano appears to be the only person that doesn't know that he is on the verge of retirement. Puck Daddy looks at another issue with the NHL's charity point. Michael Langlois has a unique historical perspective on Sidney Crosby's injury situation. Just like every other workplace, the hockey dressing room is full of pranksters. Justin Bourne has his report. Here is a plea not to cut out the hockey program at UAH. I don't see how you can host the Frozen Four and then drop the sport. Adventures in Pucking looks back at Manon Rheaume who was the only female to play with an NHL team. There is a new exhibit at the Nashville Archives about the old Sulphur Dell baseball stadium. This is one that I want to see. If you ever decide to disappear, here is a web site called Delete Your Account where you can try to become invisible. Is Amazon ready to start cranking out cheap tablets in the next couple of months? Robonaut 2 AKA @robonaut2 is now Tweeting from the International Space Station. Nashville Predators' players, coaches, dancers, and ice girls will be all over Smashville this weekend in special events and activities so this is a great weekend to get out and mingle as we are only a couple of weeks away from the Predators' Rookie Camp. The first event is the Best Buddies 5k Run with Coach Trotz which will be at 7:30 a.m. on Saturday in McKay's Mill in Franklin. From 1:00 to 6:00 p.m. at the Bridgestone Arena, the team will have an open house with plenty of activities for everyone and special appearances by the Preds' Ice Girls, Gnash, and the Nashville RollerGirls. From 1:30 to 3:30 p.m. at Centennial Sportsplex the newly formed "Sled Preds" Youth Sled Hockey program that is sponsored by the Predators will kick-off. For the nightcap, at 6:05, the Nashville Sounds will be having Predators' night at Greer Stadium in their game against Memphis. Kevin Klein will throw out the first pitch while Barry Trotz, Brent Peterson, GNASH and the Nashville Predators Dancers and Ice Girls, and Pete Weber will be in attendance. Finally, on Sunday, from 1:00 to 5:00 p.m. it will be Nashville Predators Day at the Nashville Zoo on Nolensville Road. On the Zoo’s Festival Field there will be autographs with Kevin Klein and Stu Grimson, appearances from GNASH and the Predators Dancers and Ice Girls, as well as inflatables, games, giveaways and more. POTG TGIF Headlines, News, and Links: Bring On the Weekend! Has anyone else had as tough a week as I have experienced? This has been a tough one at work as well as at home where the wife is completely remodeling the entire house with my help. I apologize for any miscues at POTG during our major project. It has to be completed before rookie camp in 15 days. Be sure and watch the great road victory in game six of the Preds-Canucks game replay tonight. After several weeks of speculation, one of the worst kept "secrets" in Smashville was officially exposed when the Nashville Predators confirmed that their flagship station would move a couple of ticks down the FM dial to 102.5 The Game which is scheduled to become an all-sports station on Monday at 6 a.m. The Game is a sister station to last year's flagship, rock station 102.9, as both are owned by Cromwell Group which is headquartered in Nashville. The Predators will be the primary sports property at The Game and have a select number of preseason games and all regular season and post-season games broadcast from the 102.5 spot on the dial. Sean Leahy at Puck Daddy has a story this morning about Predators goalie prospect Magnus Hellberg getting ejected from a game on Sunday in the Swedish Elite League for accidently firing the puck into the stands and hitting a fan after giving up three quick goals. After seeing Magnus at the draft and at development camp, that is so far out of character it is hard to believe. He is as nice as anyone you'll ever see. He was so sad at the end of development camp when everyone was leaving. Hellberg wrapped up the week saying, "It's a little bit nostalgic. You see everybody pack their backs up and they are going to leave soon. We have one more night together then it is over." On the night of the 2011Nashville Predators Skate of the Union the entire Preds management team met with the Bloggers Row group and gave us an advanced look at the new "Predator Gold" home jerseys. They explained the process that they went through on the complete redesign of the sweaters and the goal was to have something that was distinctive and stood out from the other 29 NHL teams and that would be memorable. They pointed to the "original six" teams that all had distinctive colors on the ice as well as in the crowd when the teams played on TV. This was something that they were seeking for the Preds and it appears that they have struck gold with the new color (horrible pun). Last night when I turned on game three of the Canucks-Preds replay and saw Bridgestone Arena ablaze in gold, everything we were told made complete sense. In the future when highlights are shown on NHL network or Versus and fans across North America see the gold in the background, they will know the Predators are on the ice in Smashville. When other teams come onto the ice and see the sea of gold, they will know where they are and to brace for the pounding because they will have to fight for every inch of the ice going against 60 minutes of "Predator Hockey." As we reported earlier today, The Nashville Predators will hold a rookie camp prior to the opening of the main preseason camp on September 16. Rookies will report to Centennial Sportsplex for an on ice practice on Saturday September 10 and Sunday the 11th before traveling to Sunrise, Florida for games against Tampa and Florida on Monday and Tuesday. POTG Wednesday Headlines, News, and Links: Are Preds in a Rookie Camp? Since we are immersed in the replay of the Predators-Canucks series, in historical perspective, game two was a major break through in selling "Predator hockey" to the masses in Canada over the CBC broadcast. Under the circumstances, it may have been the biggest victory in Predator history. After a complete no-show in game one, the Preds rose from the dead at the end of regulation, on the road, to give the President Cup winners more than they could handle. Pekka Rinne confirmed his Vezina Trophy nomination too. The resilient victory in game two, in double overtime, combined with the first airport reception at the Nashville airport the following day was what started to win the hearts and minds of the Canadian viewers. In game three, which will be broadcast tonight, the folks north of the border were introduced to the Smashville crowd, which until that point was non-existent according to certain MSM folks in the GTA. It is interesting to consider the rivalry that was born in this series that was seemingly not possible prior to last year's playoffs. NHL Home Ice on XM and Sirius Radio have been presenting two NHL team previews a day and today was the Nashville Predators preview featuring an interview with Preds G.M.David Poile. Go here to listen to the Preds' preview or go to the NHL Home Ice Facebook page for all the other previews and other recent interviews from around the hockey world. The 2011 NHLPA Rookie Showcase will be held at the MasterCard Centre outside of Toronto on Tuesday, August 30 and will provide Panini America and Upper Deck – the official trading card partners of the NHLPA and the NHL – with an exclusive opportunity to photograph many of the game’s top young prospects for the first time in their official NHL team uniforms, in shots that will be used for upcoming trading card and memorabilia launches. Nashville's Blake Geoffrion and Ryan Ellis will be included in the 27 players that have been invited. Other NHL prospects scheduled to be in attendance include: Jake Allen (STL), Carter Ashton (TB), Brett Connolly (TB), Simon Despres (PIT), Cody Eakin (WSH), Tim Erixon (NYR), Justin Faulk (CAR), Jake Gardiner (TOR), Brandon Gormley (PHX), Adam Henrique (NJ), Jonathan Huberdeau (FLA), Zack Kassian (BUF), Carl Klingberg (WPG), Marcus Kruger (CHI), Gabriel Landeskog (COL), Adam Larsson (NJ), John Moore (CBJ), Greg Nemisz (CGY), Ryan Nugent-Hopkins (EDM), Aaron Palushaj (MTL), David Rundblad (OTT), Jussi Rynnas (TOR), Brendan Smith (DET), Ryan Strome (NYI), and Mika Zibanejad (OTT). After suffering through last night's replay of game one of the Preds-Canucks series replay, Predator fans will find welcome relief tonight in game two action at 5 p.m. and 8 p.m. CDT where the team had a much better showing. Game one, that was described by the Vancouver media as the closest blowout in history was a real groaner as indicated by the lack of posts at On The Forecheck's open thread. I'm betting tonight's thread will be more active. The Nashville Predators are looking for a few singers of the United States National Anthem for an "2011-12 Anthem Experience" Promotion. The submission period opened this morning and will run through August 27, but will be limited to the first 50 submissions. You must be 18 years old and submit an audio or video clip performing the Star Spangled Banner in 90 seconds or less. The top three will be chosen by a committee and then their clips be placed on the team web site for voting by fans. The overall winner will get to perform at a Preds game in the upcoming season. Full details of the official rules can be found here. Here is the actual entry form. Another Monday has arrived which means we are one week closer to the start of preseason camp all through the NHL. This week, once again, we have the next best thing to live hockey. Starting tonight at 5 p.m. and then again at 9 p.m. CDT, and running through Saturday at the same times every day, the NHL Network will carry the Predators-Vancouver second round playoff series replay. Game one of the series is not particularly inspiring as it was described by the Vancouver media as "the closest blowout in history." In retrospect, it was probably what cost the Preds the series as they were behind the eight-ball the rest of the way. It may be the middle of the dog days but the Nashville Predators announced a pair of events that will make next Saturday (8-27) Preds Day all day in Smashville. From Noon to 6 p.m. on the Bridgestone Arena Plaza, the Predators will host a tailgate party with the big screen set up and all the other things you would expect from a big pre-game festival. Tickets for preseason games will go on sale and anyone who has every wanted to ride the Zamboni during a game can get their chance with the purchase of season tickets that one day only. On Saturday night, at Greer Stadium, it will be Predators night when the Sounds take on Memphis. A bunch of Preds folks will be there including the Preds Dancers that include a few new members including one of my daughter's dance instructors. Justin Bourne was this weeks guest on Ryan Porth's RLD Hockey Talk and brought his unique perspective as an ex-player into a wide ranging conversation about many of the current topics in the NHL off-season. Justin contributes at Puck Daddy, USA Today, and several other sites and is always fun to talk to. Starting Monday night at 5 p.m. and then again at 9 p.m. CDT, and running through Saturday at the same times every day, the NHL Network will carry the Predators-Vancouver second round playoff series replay. While it was not the best outcome for Predator fans, it was a coming out party of sorts that introduced Predator hockey to the folks in Vancouver as well as the rest of Canada. After the series was over, Predators' players and coaches had high praise for Ryan Kesler's play when he basically single-handely carried the Canucks to the series win. TORONTO (August 19, 2011) – Chris Drury announced his retirement today from the National Hockey League (NHL) following a 12-year career. After being drafted by the Quebec Nordiques with the 72nd pick in the 1994 NHL Entry Draft, Drury went on to play 892 career NHL games with four different teams (Colorado Avalanche, Calgary Flames, Buffalo Sabres, New York Rangers). Big news was on two fronts in the last 24 hours. The NHL Research and Development camp wrapped up with an NHL skills competition and the NHL National TV schedule was released and the Preds got the shaft (as usual). The best media coverage of the NHL TV schedule is from Steve Lapore at Puck the Media. Dirk Hoag has a great breakdown of who's in and who isn't. The NHL released its schedule of nationally televised games today and the Nashville Predators continued the tradition of receiving minimal coverage from the US national outlets. No games are currently scheduled for NBC, who will be in the first year of a new ten-year contract with the NHL. Versus Network will televise two games involving the Predators, both on the road. The Preds' game in New York against the Rangers on Tuesday, January 17 at 6:30 p.m. (CT) is first up, while their contest in Chicago against the Blackhawks on Sunday, March 25th that is set for a 6:30 p.m. start is listed as a Versus/NBC flex game but only on the Versus schedule. The Predators' home game against Calgary at 5 p.m. on New Year's Day is set to be on the NHL Network in the US but will be of little consequence to local fans as it will most likely be a rebroadcast of a feed from the Flames or Preds network and be blacked out locally. The Predators fared better on Canadian TV with two home games on CBC's Hockey Night in Canada. The first against Montreal on November 12 at 6 p.m. and the second is against Winnipeg on March 24 at 6 p.m. I'm sure the draw for HNIC is the raucous Predator crowd as well as popular Canadian, Shea Weber. TSN will have Nashville's game at Calgary on November 29th while TSN2 will also have the Preds at Rangers game on 1/17/12 and the Predators at Chicago on 3/25/12. RDS will also have the Habs at Preds on November 12. For the complete national schedules go here to the NHL.com release that has links to all schedules. Day one of the R and D camp brought few surprises and plenty of accolades for the talent on the ice. Here is Brendan Shanahan giving his thoughts to the media at the end of the day. From reading accounts and watching TSN's That's Hockey last night, the most likely immediate changes appear to be the addition of the indicator line the inches into the goal, different goal cameras, and a different kind of net to make it easier to see a goal on review. They will look further today and have an All-Star Game Skills Completion today. Here is a link to everything you would want to know about the camp. On the horizon this afternoon is the release of the NHL national TV schedule as well as the AHL schedule. I would imagine that the two game time changes announced earlier this week by the Preds would indicate that those road game will be shown somewhere nationally. Real live hockey players will hit the ice this morning in Toronto as the second NHL Research and Development Camp opens for a two day run. Here is a separate post with the rosters, complete player profile, details on the variations to be tested, as well as the rules for Thursday's All-Star Skills Competition. All documents are printable and downloadable. The NHL Network will carry a "That's Hockey" wrap up show tonight and tomorrow at 6 p.m. CDT with news from the days events and more. With the NHL Research and Development Camp starting Wednesday morning here are some handy links to the complete information provided by the NHL. Here is the schedule of all the variations to be tested at the camp. An extensive explanation and the rational behind each experiment is contained here. Here are the rosters for Team White and Team Black. In this 19 page document, you will see the complete player profiles of all players in camp. On Thursday when they have the All-Star Skills Competition, these will be the different events and categories with the rules for each. All documents are housed on Google Documents and are fully downloadable and printable. Help! Do You Know This Couple? Interesting! Long story short... A guy from England found a memory card at the Mandalay Bay Hotel in Las Vegas and by deductive reasoning figured out that the owner was potentially a couple that got married on 3/6/11 and also attended a Predators' playoff game against Vancouver. He contacted GNASH and submitted the following picture for identification. If you know this couple, contact GNASH at gnash@nashvillepredators.com with information how to find them so that they can be reunited with their photo treasures. This is a great offseason project to be a part of. We start today with sadness as for the second time this offseason an active NHL player has met an unfortunate death at a young age. Rick Rypien was found dead in his home a month after signing a one year, $700,000 contract with the Winnipeg Jets. Earlier this summer Derek Boogaard died of drugs and alcohol at his apartment in Minnesota. Rypien has taken leaves of absence twice in his career due to injuries and personal problems. Our thoughts and prayers go out to his family, friends, team-mates and all who knew him. A memorial will be held outside the Rogers Arena tomorrow at 2 p.m.
Good Monday Morning! We are one week closer to the opening of preseason camp and we will even have the distraction of the Research and Development Camp on Wednesday and Thursday this week to keep us going. Congrats to the Nashville RollerGirls who has a big 143-112 come from behind win in their bout against Carolina on Saturday night. Due to the massive renovation project at our house that has to be completed before hockey season, I was unable to attend. My weekend highlight remains seeing "The Help." I'm not sure how strong the appeal of the movie is outside of the "Old South" but it really had special meaning to me bringing back so many memories of the special bond I had (and have) with Ozell (our "Help"), who helped raise me. With both parents dead, she remains the one link I have to my childhood today. She loves to tell the story of how I "saved her life" every time we went for a walk as a toddler whenever a car drove by. My wife and I have survived six years of marriage after this crazy wedding ceremony and have grown into being best friends in spite of our individual peculiarities. We celebrated our anniversary last night by going to see "The Help" which is one of the best movies that I have ever seen. Being raised in a small Southern town during the '50's and '60's we had a maid, Ozell, who raised me and was my best friend growing up. She taught me so much about life and people as she helped mold he into a young adult. What was different than what the movie portrayed, was that she was more a part of the family and still is to this day. Lots of memories and reflections arose from seeing the movie that will have to wait for another essay at some point in the future. This week's guest on RLD Hockey Talk was the voice of the Nashville Predators, Pete Weber. Pete gives his take on the Shea Weber situation as well as discusses all of the Preds' offseason moves and more. Ryan Porth and I then discuss a wide variety of current topics in and around the hockey world. If last night's game four replay between the Preds and Ducks was the most disappointing game in the playoff series, game five, that will be on tonight, is the best. In many ways, the overtime thriller was the turning point in the franchises' history of post-season mediocrity. The series will wrap up on Saturday night with the Predators clinching the first playoff series in franchise history. After a week of Eastern Conference semi-finals, the Predators-Canucks round two series will be shown starting August 22 on the NHL Network. Tomorrow night will be a big one for sports in downtown Nashville with the Tennessee Titans having their opening exhibition game on the East side of the river and the Nashville RollerGirls having a bout at the Municipal Auditorium on the West side. The NRG have a head start with the opening bout at 5:30. OI would suggest an early arrival in order to secure the best parking opportunities. It is now less than six weeks until the Nashville Predators kick off the 2011-12 NHL Pre-season schedule with a rare hockey double-header against the Florida Panthers at the Bank Atlantic Center. The preseason runs through Tuesday, October 4 when three games will take place in Europe. The regular season kicks off on Thursday, October 6. I can't remember a time in Nashville when the anticipation of the Predators season has been as great as it has been this summer. Normally in August, there is little buzz and a dearth of stories written about the Preds. This year, even in the post Shea Weber arbitration hearing days, there has been a constant flow of stories and Preds discussion locally. The replays of the Preds playoff game against the Ducks this week appears to have sparked interest too. We also see in an article below, that the ticket buzz for the Preds has exceeded that of the Titans which has been unheard of in the past. After a big win in game three on last night's replay, the NHL Network will have game four of the Preds-Ducks first round match tonight. The games have really caught on in Pred-land with Dirk Hoag's open thread for a replay getting over 100 comments. The second annual NHL Research and Development Camp kicks off next Wednesday, August 17 at the MasterCard Centre in Etobicoke, Ontario with a long list of variations on the current rules to be put to the test. The top prospects that will be eligible for the 2012 NHL Entry Draft, rumored to be in Pittsburgh, will be on the ice demonstrating the changes. I have to admit that I am so desperate for real hockey that I have been sucked in by this week's replay of the Preds-Ducks series. I have avoided looking at the final results prior to watching and let my "old-timers" kick in so that each game seems somewhat fresh and fun to watch. The empty netter in game two when the Preds were down 4-3 in the closing moments was a killer in last night's replay. Check in tonight for Game 3 action with a more friendly result. It was amazing to sit and watch the NHL Network's presentation of the Predators-Ducks game one of their opening round Stanley Cup series last night and hear Pete Weber and Terry Crisp on the call almost four months after the live action. It really brought home the fact that this year's Predators team will have a new look with plenty of new faces in key roles. It is going to be interesting to watch Jon Blum and Blake Geoffrion try to improve upon their debuts last year as they still will be eligible as rookies this season. Others will have to fill the rolls of Steve Sullivan, Joel Ward, Shane O'Brien, and Cody Franson who were key players during the playoff run. Game two of the series will be tonight on the NHL Network as the series continues nightly through Saturday. The Nashville Predators continue to stock defensemen on two-way contracts with the addition of Jack Hillen who played for the Islanders for parts of three seasons. The signing comes on the heels of the Preds successfully sending Brett Lebda through waivers earlier today. There remains questions as to whether Lebda can be bought out at this time. Welcome to another wonderful Monday morning where everyone gets to head into the work week with a clean slate to deal with new issues to go along with all those that were unresolved last week. The good news is that the hockey offseason is moving along quickly with only five weeks remaining until camps open and action returns to the ice. I'm not sure why but this summer has flown by much quicker than those in the past few years. Note that today is the final day of tax free savings with the Predators and Bridgestone Arena. Austin Watson and Chase Balisy are on opposite teams at the Junior Team USA Evaluation camp and each scored two goals on Saturday night as Watson's "Blue" team bested Balisy's "White" team 4-3 in Lake Placid, NY. After another match tomorrow, the two squads will start playing teams from Finland and Sweden as the camp continues through Saturday August 13. Miikka Salomaki, who was drafted in the second round by the Preds in June, is playing for Team Finland. For what should be a dead weekend in the hockey world comes breaking news from the Predators on Bret Lebda and also on the 2012 NHL Entry draft. Also, Tax Free Weekend bargains continue through Monday with the Predators and Bridgestone Arena. Well removed from last season and still another six weeks until preseason camps open, this would be a good time to watch the classic movie "Pond Hockey". Now that the Shea Weber verdict is out, I have a feeling that we will head for a fairly quiet period on the news front in Smashville. We have about six weeks until camp and it was made clear prior to the conference call on Tuesday that there would be no one on ones or radio interviews after the call. That is probably the best for David Poile and Shea Weber at this point that everyone has plenty of time to focus on other things for a while before all come together again at preseason camp. Short of the potential of a few minor tweaks, I think that the Predators will head to camp with what they have and see how things look at that time. They have the financial flexibility to add a player or two if the terms are in the team's favor but there is not a whole lot out there for the pickings at this time. All the excitement in Smashville in the last few weeks surrounding the Shea Weber negotiations and arbitration hearing is proof that there really is no offseason in hockey any more. As a result, Nashville based hockey blogs have continued to do well in the Wikio Rating service with four sites finishing in the top twenty-two in July. On the Forecheck came in second, RLD Hockey was at sixth, PredsOnTheGlass finished tenth, and Section 303 rounded out the group at 22. On behalf of all four as well as the many other fine Nashville based sites, I feel comfortable in saying that all appreciate the readership and support. Rarely do the Nashville Predators find themselves as the center of attention throughout the hockey world but yesterday was one of those occasions. The day started with questions of what would transpire with Shea Weber and the arbitration result. When it was revealed, the Predators scheduled a joint phone conference with both Weber and GM David Poile where both parties said all the right things. Go here for audio of the conference in its entirety. In a highly conciliatory move, Nashville Predators GM David Poile and defenseman Shea Weber appeared jointly in a media conference call shortly after Weber's $7.5 million, one-year, Arbitration award was announced. Both Poile and Weber were pleased with the result and claim that the goal remains for Weber to lift the Stanley Cup in Nashville. Make the jump to hear the conference call in it's entirety. Multiple reports indicate that the arbitration verdict is out and that Shea Weber of the Nashville Predators will receive $7.5 million for the upcoming 2011-12 season. Weber and the Predators were unable settle on a figure prior to Tuesday's arbitration hearing. During arguments the figures thrown out by the two parties ranged from $4.75 to 8.5 million by the two sides. Weber will again be a restricted free agent at the end of the next season but the team cannot ask that he return to arbitration for a second time under the current collective bargaining agreement. He will be an unrestricted free agent on July 1, 2013 if he is not signed to a longer term contract in the interim. I had speculated last week that a fair figure would be between $7 and $7.25 million so the final amount was with in a reasonable range based on other comparables. It would appear that a potential long term deal would start at the $7.5 figure and escalate from there making a lengthy deal unlikely at this time. When I left on vacation last week, I was fairly well convinced that Shea Weber and the Nashville Predators would come together on a deal that would keep the captain safely in tow for the next four or five years. I'm back home now and shocked that it didn't happen. Happily, I avoided Twitter for the most part for the past few days but from what I could tell, the carnage among Predator fans was horrible. #WeberWatch was out of control as the hours ticked down to yesterday's arbitration hearing. When Elliotte Friedman Tweeted that the spread between the two sides was $4.75 to $8.5 million, the panic reached a crescendo. The numbers really meant very little in the big scheme of things. I still maintain the ruling will come in around $7 million, give or take a quarter million or so. 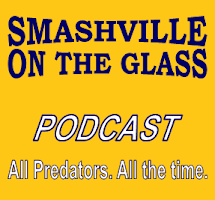 Ryan Porth at Smashville 24/7 has been doing a series on "Getting to Know Your Predators Blogger's Row Writers" and has completed interviews with Jeremy Gover, Amanda DiPaolo, and me. There was a problem in that no one was asking him any questions.